It doesn’t matter if you’re interested in a swimming pool cover is for safety, keeping the pool clean, or saving water and chemicals, you have come to the right place. California Pool Guard is the undisputed expert in California when it comes to Pool Covers. It may not surprise the locals here in California, that our pools are rarely simple rectangles. In several other states its normal to see basic pool shapes, but in California, basic is not normal. In the Pool Cover industry that means custom, and that’s what California Pool Guard is best at. 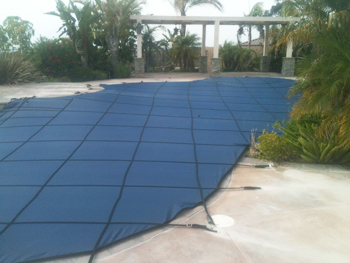 Look up one of our expert and local Pool Cover dealers through out California. This pool cover material, since it’s the lightest weight, is the most popular choice. It doesn’t hurt that it is also the most affordable and very easy to use. The material and the pool cover design has been tested time and time again from cars crashing onto it to and heavy snow falls. When tallying orders from the last couple of years from Los Angeles and Sacramento, it is clear this is style of cover we install of the time. A Pool Guard Lite cover will give you a great mix of controlling swimming pool water evaporation, chemical preservation and a secure, safe, and clean pool. 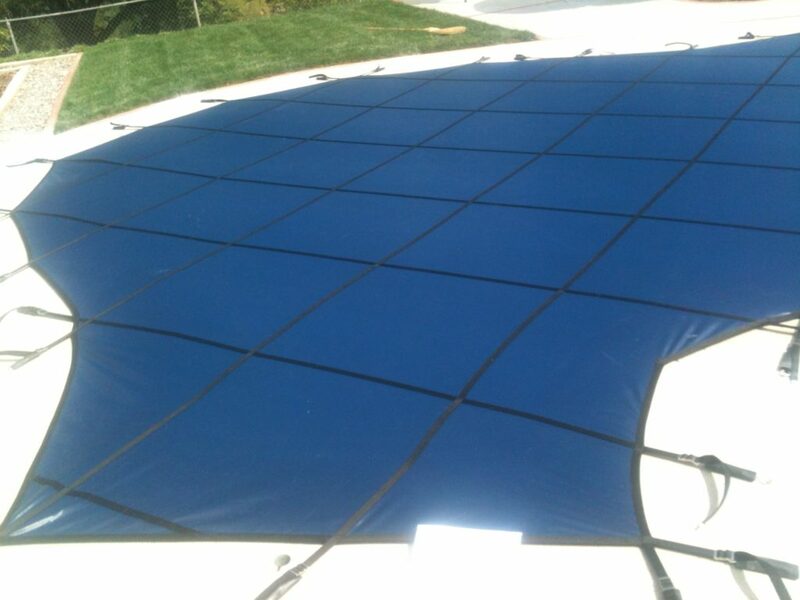 The Pro Mesh version of the Pool Cover is designed to filter out finer particles and block more sunlight, but it’s also a little stronger than a Lite cover. While more expensive that a Lite cover, this is great for those of us in southern or central California that are worried about water preservation and the drought. Pro Mesh will provide you with the best combination of evaporation reduction, chemical preservation, and ease of use. The Solid Safety cover keeps the water and chemicals in the pool longer. By keeping out the sunlight, the evaporation is less, but the chlorine also lasts longer. Of course, it does a superior job at keeping dirt, dust and leaves out. This will allow you to open a very clean pool. The only negatives are the Solid Safety Pool Cover is heavier and not as easy to manage. It costs more than the Lite, but most importantly since it’s a solid, it also means water stays on top of the pool cover when it rains. When this happens the Solid-Guard can become a safety risk to children because you will have a puddle of water on top of your pool. The cover industry, therefore makes it a requirement to purchase a sump pump with a Solid-Guard cover in order to pump away the risk. Our pool safety covers are simply the best in the industry. The quality of materials, workmanship and multitude of options available ensure you’ll get a beautiful pool cover that provides safety and peace of mind for years to come. Call California Pool Guard to select which type of pool cover is right for you and your pool. Swimming Pool covers require experience in custom ordering, so it’s best to consult our trained staff. After measuring your pool, we use computer-aided-design to create safety pool covers that perfectly fit your custom size or shape of pool. Without paying more, you get a strong, safe pool cover that meets or exceeds ASTM Standards ES1346-91 for pool safety covers, when properly installed. Pool Guard’s superior hardware technology, with high performance stainless steel springs and sturdy brass anchors, makes our swimming pool covers safe and easy to use. Take a closer look a pool cover with this clip of our L.A. Dealer showing how to take off cover springs. Double Webbing – Our Pool Guard pool cover feature double webbing! The black straps that crisscross the cover (webbing) are stitched on both the top and under side of the cover, greatly increasing its strength. The webbing is fabricated to have a tensile strength of approximately 4,000 pounds per square inch, making the pool cover super strong and safe. Stitching – The webbing for the entire cover is sewn on with triple stitched bonded threads. Around the perimeter, all intersections have an additional “X” and box stitch sewn for extra strength. Quick Installation Springs & Hardware – Our “trampoline style” pool cover is locked down by our unique spring and anchor system. Our heavy-duty stainless steel spring, with its custom designed “easy adjust” integrated buckle enables quick installation and adjustment of the pool cover in a fraction of the time. All springs come with a plastic cover to protect the pool deck from abrasion. Anchors – Our anchors are made from non-corrosive brass. When not in use, the anchors recess flush with the pool deck and are barely noticeable. We have an anchoring system for any type of decking, masonry, wood, pavers, etc. Complete Package – All pool covers come with a convenient storage bag, installation instructions, warranty and cover care guide. Also included are the installation hardware pieces (i.e. heavy-duty installation tool, tamping tool, spring covers and Allen key). 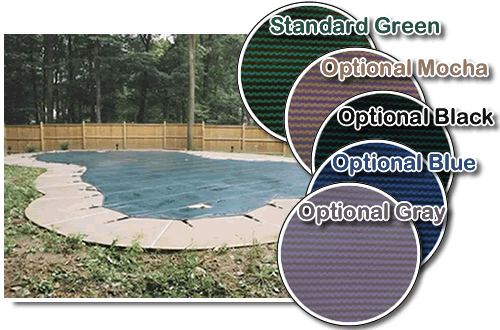 Strap Spacing – Our pool covers are custom designed and manufactured to your pool. The strap spacing will depend on the shape, size and location of your pool. Some pools will have the option for 5×5 foot spacing while other pools are required to have 3×3 foot spacing. Plus, the added quality of being made in the U.S.A.
What Makes a Pool Cover a Safe Cover? All safety covers must conform to the Standard Performance Specification set by the American Society for Testing and Materials (ASTM). According to the ASTM 1346, a safety cover must be able to support a certain amount of weight (485lbs), not permit gaps greater than 4-inches that a child or pet could squeeze through, and remove standing water. A safety cover which looks like a trampoline stretched over the pool is a lot more aesthetically appealing. A typical solid pool cover is little more than a tarp to put over your pool. It does not conform to ASTM safety standards and can be dangerous to kids and pets. Typically, it is anchored with water bags or water tubes or some homeowners place bricks or large items on the cover to anchor it in. While a plastic tarp does keep the majority of the leaves, debris and silt out of the pool, it is still possible for children and pets to get under it and into the pool, or even get into trouble with the standing water that has accumulated on top. This is a great clip that shows the difference of a safe pool cover vs. a cover just to keep the pool clean. The Surface Drainage Test which safeguards against a dangerous amount of water collecting on the cover’s surface. The static load test for weight support. The cover should be able to hold a weight of at least 485lbs (2 adults and 1 child) to permit rescue operation. Labeling requirements must include basic consumer information such as the warranty information, the appropriate warnings as described in the standard, and acknowledge the product as a safety cover. For more details on barrier code and adoption foster care requirements in California reference click here. What do swimming pools and a drought have in common? California is prone to having both. While lately we have seen in the news the problems of the current drought and the many ways to save water, you might have noticed that swimming pools aren’t mentioned very often. That will change if the drought continues. You have already heard about your toilets and shower and washing your car and especially watering your lawn, but take a look at this rare Pasadena Star-News article. It truly sheds light on how much water and energy pools really take in a year. To be blunt, that’s a lot of toilet flushes to keep up with pool evaporation. Let’s take it one step further. Whether you know it or not your toilet flush and shower will, through one process or another, most likely eventually go back into our ground water supply to be reused. Your swimming pool water evaporation on the other hand, goes straight into the air becoming a small amount of humidity that blows east to the rest of the country. What’s most interesting is that almost nobody is talking about it. Santa Barbra has decided to be one of the first communities to notice it with changes to their laws. Will your community be next? I suspect the central valley ( Sacramento Modesto) , Los Angeles, and maybe San Diego counties will be next. We have a pool cover safety professional in San Diego, Los Angeles, Orange County, Palm Desert, Sacramento and Northern California Area and Riverside & San Bernardino Counties.